See the difference in slow cooling an electric kiln firing! If you have ever had problems with pin holing or dunting, slow cooling your kiln could be the solution you are looking for. But slow cooling also can produce cool surface effects in your glazes. In today’s post, Deanna Ranlett explains more about slow cooling and shares her electric kiln firing schedule. – Jennifer Poellot Harnetty, editor. Down firing, or slow cooling, refers to controlling the rate at which your kiln cools. I’ve programmed my kiln to a slowly cooling rate for a variety of purposes, ranging from slow cooling large work to reduce dunting to cooling slowly and holding at certain temperatures to form glaze crystals. Slower cooling reduces stress on ceramic wares and is well worth the extra time. For glazes containing zinc, rutile, calcium, magnesium, lithium, and iron (to name just a few), slowing the cooling rate can result in some spectacular effects, ranging from feathering to small crystals and in some cases a fully-developed satin-matte surface. The combination of a short soak at peak temperature and then down firing can also eliminate pin holing in some glazes. World’s #1 Pottery Techniques Magazine–Pottery Making Illustrated. Discover the secrets to throwing, handbuilding, decorating, and glazing from the world’s leading pottery experts. Each issue is packed with tips, techniques and practical information you can use to have more fun in the studio. Many new computer controlled kilns come with built-in preheat or cool-down programs, but I have an older model computer-controlled kiln so I program my own firings. Tip: If you plan to use a pre-program set-up, test the program in a typical firing using self-supporting Orton cones to calibrate the kiln. The type of kiln, type of ware being fired, and the size and density of the average ware stack inside the kiln can impact final temperature determinations, but this initial calibration firing gives you a baseline for the length of the firing to reach a specific temperature. Over the years, I’ve determined that the pre-programmed cone 6 firings tend to overfire my work. I tend to pack my kiln very full and the result of the pre-programmed firing schedule finishes closer to cone 7 than to cone 6. As a result, I’ve researched additional down-firing schedules and came across Ron Roy and John Hesselberth’s Mastering Cone 6 Glazes book. In the appendix, I found a perfect starting point for a cone 6 down-firing. To this initial schedule, I’ve made adjustments to suit the way the kiln is loaded, and to take into account what the self supporting cones told us about the firing speed, and the end temperature. John’s Tenmoku. Left: Fired on a medium speed cone 6 program, resulting in a glossier, darker in color. 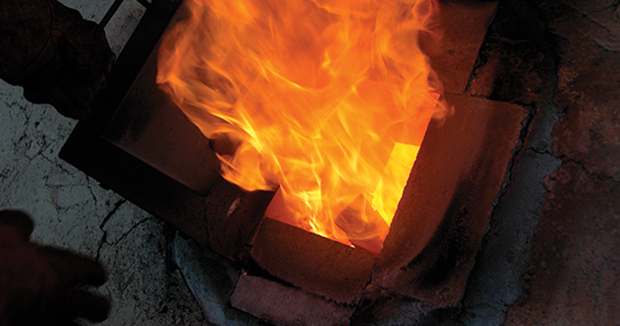 Right: Fired to the cone 6 program on page 14, resulting in gold crystals formed when cooling. I’ve also learned that generally, the slower the climb to temperature, the lower the end temperature, so programming a hold at your desired peak temperature also impacts what the end shut-off temperature should be because heat work continues to occur during those slower periods. A hold at the end of a firing allows a slight soaking effect which allows all work to reach temperature if there’s any unevenness inside the kiln from top to bottom. It also allows glazes to move together and flatten a bit, which is great if you’re creating a reduction-fired effect by layering multiple glazes. Refer to your kiln manual or manufacturer’s website for proper programming instructions. If you’re down firing for crystalline growth, you want to keep the glaze fluid enough so that crystals can form but not so fluid that it starts to run. 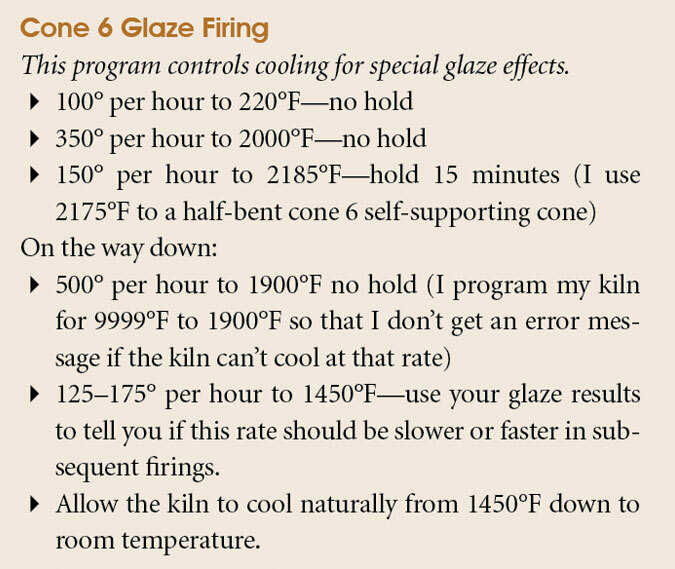 In my experience, it’s best to hold the glaze firing for fifteen minutes to about 60° lower than the cut off temperature for a pre-programmed firing. To begin controlled cooling, allow the kiln to cool as fast as it can for the first 300° so the controlled portion of the firing is taking place about 300° lower than the cut-off temperature. I have experimented with different cooling rates ranging from 125° per hour to 175° per hour depending on the type of glazed surface I desire. To prevent dunting (cooling cracks) in a sculpture firing program, the cooling period isn’t done for development of glazes but to minimize fast heat loss around larger work. I recommend a cooling rate of about 200° per hour through quartz inversion (1063°F). Crystal growth in some glazes can vary depending on the rate of down firing—a fast cool results in a glossy surface, while a slow cool goes matte. The crystals creating the satin surface are happening between 1900°F and 1450°F. Some glazes can form small crystals during the soaking period but for the most part, the controlled cooling is allowing the crystalline structure to form. Caution: Make sure that your glazes aren’t becoming less stable or less food-safe due to changes in surface texture from crystals forming in the glazes. Perform leach tests on all results. While controlled cooling is more difficult in a manual kiln, it’s not impossible. You can re-engage your kiln sitter, which forces your kiln to remain on despite the cone dropping. This is where things can get a little tricky, so you would want to make sure you set your safety timer as a back-up in case you get interrupted and don’t remember to turn off the kiln. Let the kiln sitter drop and allow the kiln to remain off for 15–20 minutes—the temperature drops rapidly when the kiln first shuts off. After this, use a combination of medium and low switches to create gentle heating as the kiln cools—try 1–2 hours on medium, then 1–2 hours on low so the kiln cools by about 125–175° per hour. This allows extra time for your glazes to develop a crystal structure or for large sculpture to cool slowly. Keep a log of all your changes and results so you can make adjustments to the timing you used to turn switches to medium or low on the down firing. Down-Firing Kiln Schedules (above) Because the bisque firing has already changed the clay into ceramic material, temperatures can increase faster through the middle of the glaze firing. bisque, bisque firing, ceramic, clay, color, cone 6, cone 6 glazes, crystalline, cut, deanna ranlett, decorating, develop, dunting, electric kiln, experience, fast, firing, firing down, firing kiln, firings, form, glaze, glaze crystals, glaze firing, glazes, glazing, growth, handbuilding, heat, illustrated, in the studio, information, iron, kiln, kiln firing, kiln firing schedule, kiln sitter, move, pottery, pottery making, pottery techniques, quartz inversion, reduce, reduction, results, rutile, safe, safety, sculpture, set, shares, short, size, soaking, solution, studio, surface, techniques, tenmoku, texture, throwing, time, tip, tips, ware, zinc. How do you reengage the kiln sitter in a manual kiln? Hi folks, I’m low firing for a cone 05 glazing load. I have a big, manual Olympic kiln and I slow fire every thing! Start to finish, usually takes 14 hours, but it needs at least six hours on high – all three dials. I try to hold the final temp 1880 F by flipping switches, down to medium, then up again. Then I fire down from high to med for two hours, then turn everything off. I keep the lid closed until the next day at least 14 hours or more – don’t force cool! Be patient! Don’t prop the lid until a pyro-meter reads the inside of the kiln is less than 100 F.
My little Paragon kiln gives me a ftl message every time I try slow cooling. I’ve set the temperature speed all the way up and also all the way down to see if I can get it to work. It just doesn’t seem to cooperate for me. Any suggestions? With the chart shown above concerning slow cooling, are you saying that once the kiln cools to 1450 degree, I should ‘turn off the kiln” and let it cool naturally to room temp? Hi Karen – on my kiln this varies from 12 hours and 20 minutes to 13 hours depending on how dense the load is. The cooling cycle is also affected by how dense the load is. Can you tell me roughly how long the cone6 firing takes to reach temperature? Thank your for this article.